Embedded Linux system Archives - Inforce Computing, Inc. Choose your OS (Android/Linux), and then the “Without the starter kit” option (bare board only). That’s it! Enjoy this limited time only promotion to buy one of the most versatile and powerful ARM®v7 ISA based SBC for your exciting embedded projects. Prototype and build hands-free computing/AR Head-mounted displays, videoconferencing/collaboration, Drones, and Robotics systems. Hurry–this offer won’t last long! This discount offer applies for the bare-board option only–No starter kit is included. The coupon is valid for only one unit of purchase per person. Offer valid until stocks last. ©2015, Inforce Computing, Inc. All rights reserved. Have you wondered what would it take to implement a modern embedded system design with a system-on-module (SOM) as opposed to building your entire system from scratch? What are some of the clear advantages to designing with a SOM? Are you perennially stuck in the build-vs-buy argument on whether or not to design the most time-consuming and complex compute portions of an embedded system in-house? What’s a carrier board and how to design a custom one that can be re-used by new SOMs that come down the line? 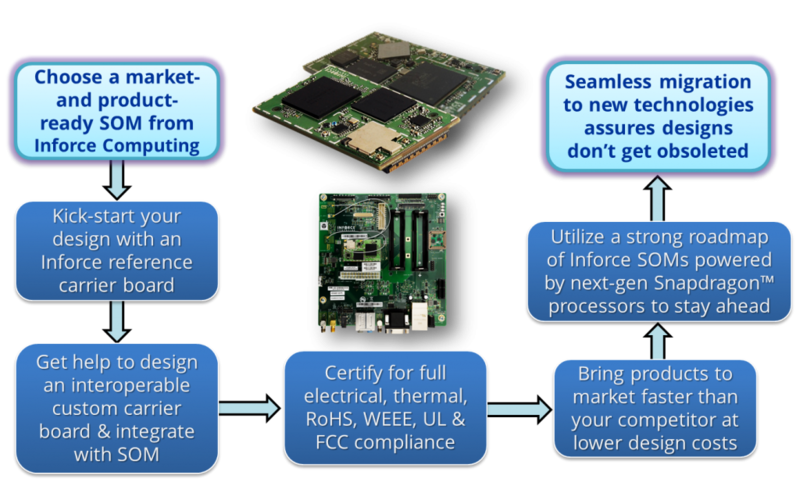 Is your design going to be obsoleted because of a lack of a microprocessor roadmap from your semiconductor vendor and upward/cross-compatibility of your custom carrier boards? Are you missing your market windows and are looking for a solution that addresses time-to-market issues and cost escalations? Have you hit the limits of your current system’s compute power? Would you like to obtain access to high-performance and low-power state-of-the-art Qualcomm® Snapdragon™ processors without the need to license them? To find out answers to the above questions and kick-start your embedded design with the latest Inforce 6501 Micro SOM, please download a whitepaper on the subject here. Should you have further questions after reading it, please reach out to us.